You've probably eaten pumpernickel bread many times before, but do you have any idea what it actually is? It's dark and hearty, and kind of tastes like rye bread, but beyond that, do you know anything about pumpernickel? Always up for posing those somewhat embarrassing questions that you don't really want to ask out loud -- like what the hell are capers and where does vanilla really come from? -- we've decided to investigate this common bread. Pumpernickel is a type of rye bread that is originally from Germany. The origin of the word is pretty entertaining: It's a German word that comes from pumpern, which means to to break wind and Nickel, a take on the name Nicholas, which is associated with goblins or devilish characters. The word comes from the bread's "reputed indigestibility." So, the bread can be translated as the devil's fart, or something like that. Now that we've got that covered, let's investigate how this devil's fart bread is actually made. Pumpernickel is made with pumpernickel flour, which is made from whole rye berries that have been coarsely ground. According to The Kitchn, pumpernickel differs from regular rye bread because while the former is made from the whole rye berry, the latter is made from the endosperm of the rye berry. Light rye is made with the "white rye flour ground from the center endosperm of the rye berry." 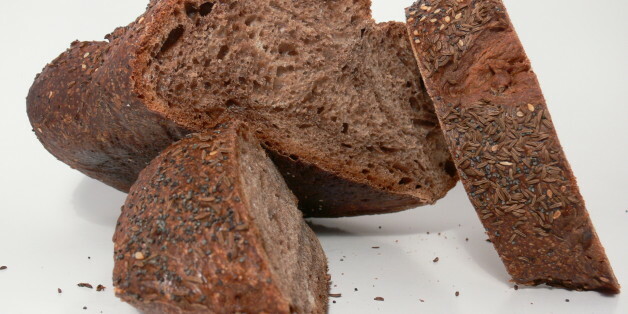 Dark rye might be made the same way and then dyed to darker colors with the addition of the same ingredients that make American-style pumpernickel dark. It might also be made with more of "the outer endosperm, which contains more of the coloring pigments from the rye berry." The German style of pumpernickel combines a sourdough starter and sometimes yeast with the flour. The dough then cooks in loaf tins at a low temperature for up to 24 hours. The long cooking time browns the bread significantly, bestowing it with its iconically dark color. The American style often forgoes the sourdough starter and the long cooking time. It achieves its dark color with the addition of ingredients like coffee, molasses or chocolate. Whether you're getting the authentic German style or the American version, next time you're eating pumpernickel, you can remind your friends that you're eating something that was named after a farting devil.